The ESV Study Bible was created to help people understand the Bible in a deeper way. Combining the best and more recent evangelical Christian scholarship with the highly regarded ESV text, it is the most comprehensive study Bible ever published. 9.75" x 6.75" x 2.50"
Now available in large print, making the ESV Study Bible accessible in every sense of the word. This large print edition features a 10.6 point font size. ESV Study Bible Large Print Hardback by English Standard was published by Crossway in July 2014 and is our 3253rd best seller. The ISBN for ESV Study Bible Large Print Hardback is 9781433544132. 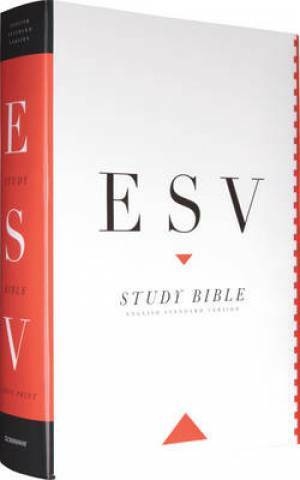 Be the first to review ESV Study Bible Large Print Hardback! Got a question? No problem! Just click here to ask us about ESV Study Bible Large Print Hardback. A:I can confirm that there is free access to the online version with any purchase of the ESV Study Bible, including this Large Print Edition. Thank you for using Q&A Forum. Are the notes also 10.6 font? Does the LP edition include the full content of the ESV Study Bible (as opposed to the Study Study Bible. A criticism of the other personal edition ISBN 9781433544316 is that the print shows through from the other side of the page, does this apply to this edition? Thanks.